Toronto Argonauts’ slot back/kick returner, Chad Owens is on the verge of making CFL history this weekend against the Montreal Alouettes. Owens requires just 305 all-purpose yards in order to reach the 3,000-yard plateau for the third consecutive season. In 2011, Chad became the first ever professional football player to record 3,000 + all-purpose yards in back-to-back seasons. Owens is also attempting to become the first ever player to lead the CFL in kick return yards and receiving yards in the same season. Owens currently leads the Canadian Football League in return yards with an incredible 1,742 and also ranks second in receiving with 938 yards. Chad trails Alouettes’ wide receiver, S.J. Green by only fifteen receiving yards as both men prepare to go head-to-head in a crucial game on Sunday afternoon in Montreal. Chad has experienced tremendous success against the Montreal Alouettes over the course of his four-year CFL career. In the most recent meeting with the Als on July 27, 2012, Owens recorded a magnificent 227 all-purpose yards including seven catches for 97 yards receiving and two touchdowns. On August 14, 2010, Chad recorded 163 yards receiving and two touchdowns against Montreal. Owens made his CFL debut as a member of the Alouettes in 2009. He played only one game for the Als’ and was traded to the Argonauts’ just days prior to the 2010 CFL season. Owens has already set a career high in receiving yards with 938 through eleven games this season. Chad has five career touchdown receptions against the Alouettes and with just 62 receiving yards on Sunday, he will surpass the 1,000-yard mark for the very first time in his professional football career. On the opening day of this 2012 CFL season, Owens etched his name in the CFL record books, as he became only the third player in CFL history to have a 100,100,100 game. Chad recorded six catches for 100 yards along with 111 yards on four kick returns, and 105 yards on seven punt returns. Owens followed up his 100,100,100 game with a 402-yard performance against the Hamilton Tiger-Cats on Labour Day. His 402 all-purpose yards is the most in Argonauts’ history. Owens is on pace for more than 4,000 total yards in 2012- which would be the highest single season total in professional football history. In order for Chad to set the all-time record, he needs to average close to 200 yards per game during the final seven weeks of this CFL season. At this point last season, Owens had only 1,162 total yards. Owens has the opportunity to collect two records in one game on Sunday afternoon. If he is able to record at least 62 yards receiving and 305 all-purpose yards, Chad will reach the 1,000-yard receiving plateau as well as the 3,000 total yard mark. Chad has accomplished many incredible feats during his four-year CFL career. In four seasons, Owens has amassed a sensational 8,797 all-purpose yards. He is on pace to shatter Michael “Pinball” Clemons single season yardage record and continues to climb the all-time return list. Owens is definitely the Argonauts’ Most Outstanding Player and if he is able to continue his sensational play in the final seven weeks of this CFL season, he can surely be in consideration for the CFL MOP award. 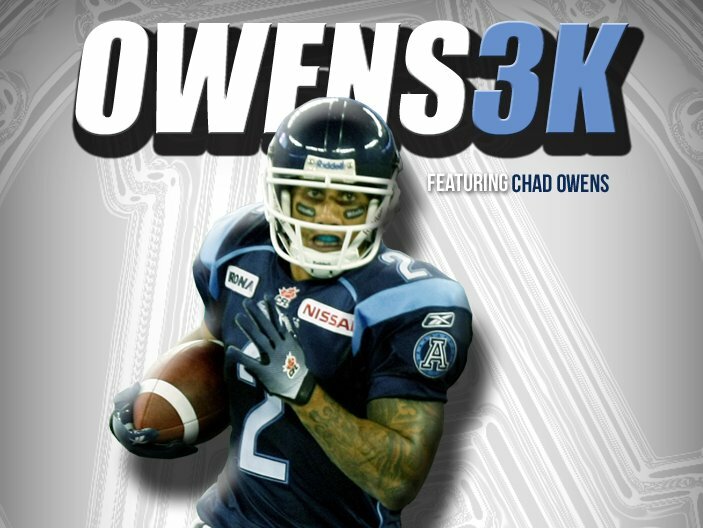 Argos’ fans can chat and keep track of Chad’s quest for 3,000 all-purpose yards on twitter by using the #Owens3K3 hashtag. Tune in on Sunday afternoon to witness history as Chad Owens looks to become the only professional football player to record three consecutive 3,000-yard seasons.